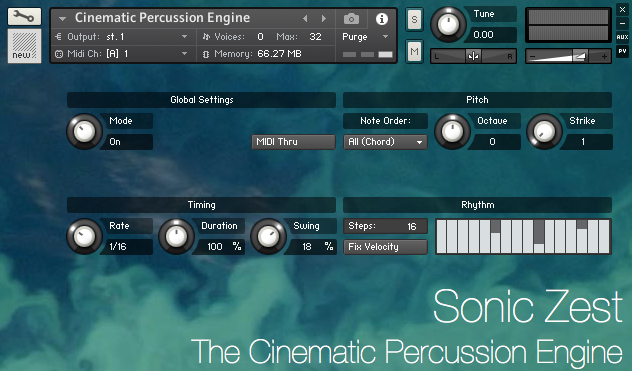 A cinematic percussion engine instrument that will keep you entertained for hours. Includes 3 patches: 1) The Cinematic Percussion Engine, as well as two melodic/tuned instruments – 2) The Metal Pan and 3) The Glass Bowl. Over 100 MB of samples (20 MB download). 1. The Cinematic Percussion Engine. This is where the bulk of the sounds sit. These sounds are percussion and non-melodic. They are run through an arpeggiator with a rhythm station attached, allowing complex, unusual and 100% customisable creations. 2. Metal Pans – This is the first of the melodic instruments. An assortment of metal pans/drums were recorded and tuned – allowing you to compose your own melodies. 3. Glass Bowl – In the same style as the above, an assortment of glass bowls were recorded and tuned. This has an almost pan-drum like quality. Together these three sets of sounds sit together incredibly well. They are similar to the sounds used in the Brick soundtrack, as well as some of Thomas Newman’s recent compositions. Have you ever noticed how in a tense scene of a movie there is a tinkling or rattling sound used in the soundtrack. It’s often used to underpin the tension and add a whole new dimension to the experience. Whether you’re scoring a heist movie or a spy movie, these dynamic percussion sounds are a must. We went into the studio and recorded a wide range of glass, metal and wooden percussion sounds. Armed with five round robins, we then ran the whole collection of sounds through an arpeggiator – enabling you to readily produce the grooves you’re after. 1. Mode – Switching between on and off will switch between single sounds and percussive rhythms. 2. Note Order – Switching between ‘All (Chord)’ and ‘As Played” will toggle between whether multiple notes are played at once or not. Use ‘All (Chord)’ once you need a lot of percussion going on and use ‘As Played’ when you need inspiration in creating complex and unusual grooves. 3. Rate – This changes the playing style and rhythm. 1/16 is a good setting to start with. Scroll through the settings to find what you like. 4. Swing – This is self-explanatory. I use anywhere between 2% and 13%. Too little and your rhythm will sound mechanical and robotic. Too much and it will sound almost comical. 5. Rhythm – Finally, this is where you can begin to really tailor your grooves. I personally go for a wave shape, so the sound is either getting louder or quieter. This provides added realism. I also recommend being random – it’s a great way of coming up with something fresh, new and unusual.